Flying Officer Wilson flew Spifires with the RCAF's 411 Squadron (in 126 Wing as part of the Second Tactical Air Force, under the command of Group Captain Gordon McGregor, later president of Air Canada) and scored two victories during WWII. Afterward, he found employment as a bush pilot in Canada. I had the flying bug... and it rubbed me the wrong way that the State of Israel was the underdog.... I went through Bergen-Belsen. How can you describe it? Hundreds of walking skeletons. People dying in droves.... The papers were full of stories that the combined Arab states were going to drive the Jews into the sea. I was mad I guess, and I wanted to help the underdog. Soon, Wilson was showing his log book to a firm of lawyers, who gave him a plane ticket for travel in the fall. Wayne Peake also joined the three Canadians, who had fake identification papers, on the trip into Israel. While in Israel, Wilson earned 150 pounds a month. Upon arrival at the 101, Wilson and the others found that the squadron had three operational fighters: a Spitfire, a P-51 and a S-199. Wilson flew a mix of aircraft from a Piper Cub on photo recon to the P-51D, although he didn't fly the dreaded S-199. He spent most of his flying hours in the familiar Spitfire. In late October or early November, Wilson flew Spitfire D-131 on a test flight. Its undercarriage failed to function and Wilson safely belly-landed the aircraft. Although the plane required repairs, Wilson was not hurt. An investigation revealed that sand had entered the hydraulic reservoir. Wilson survived harrowing experiences on the ground as well as in the air. Once, he and Wayne Peake took a jeep to search for a missing plane. They passed a barbed wire fence and entered a mine field, which they only discovered after a mine blew up the rear end of the jeep. They abandoned the vehicle and walked back on the tire marks their jeep had made. Although I don't know the date or the victim, Wilson scored an easy victory while in Spitfire D-130 on a photo recon mission over the Faluja Pocket. Denny flew D-130 on November 20, December 1, and December 4, although which if any of these dates saw the victory remains unknown. Wilson still fondly remembers Christmas 1948, for it touched him deeply. The government of Israel organized a Christmas dinner with turkey and trimmings for the Christian Machal pilots in 101 and followed that up with a bus ride to a Jaffa church for Christmas mass. On Dec. 29, Wilson (in Spitfire White 14) and Arnie Ruch escorted two of 69 Squadron's B-17s on a raid on the Faluja Pocket. After the bombers dropped, the two Spitfires headed for Al Arish. As far as is known, no Americans flew for Egypt, although faulty intelligence reports at the time did have two Americans flying for the Egyptians. Wilson damaged one of the two remaining REAF Spitfires, which fled towards Al Arish, and attacked the other. Wilson's most memorable mission took place on the last day of 1948. 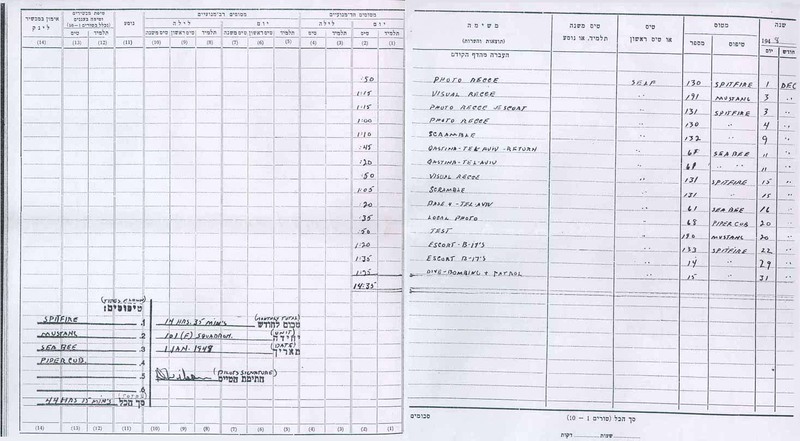 Wilson's flight log indicates that he dive-bombed before patrolling the airspace near Egypt's Bir Hama base. On the way back, Wilson and his wingman, Syd Cohen, detoured toward Faluja. After this fight, Wilson and Cohen joined up with a pair of Israeli Spitfires that were strafing a truck convoy on the Al Auja-Abu Ageila road. On the final day of the war, Jan. 7, Boris Senior and Jack Doyle in Mustangs were escorting 35 Flight's Harvards to attack Egyptians at Dir El Balah when they encountered eight REAF Macchis above the Al Auja-Rafah road. Wilson, in Spitfire White 16 fresh from feasting on the RAF) and wingman Arnie Ruch were also in the air and found what they thought were eight REAF Macchis on their low 3. The Egyptians saw the two above them, jettisoned bombs, and climbed toward them. In fact, there were only six Macchis. Ruch and Wilson misidentified Jack Doyle and Boris Senior in P-51s as two more Macchis. The Egyptians didn't see Doyle and Senior at all. In the ensuing battle, both Senior and Doyle claimed a kill, although Egyptian records indicate only one plane lost. Wilson, separated from Ruch in the fight, found himself in a gaggle of five Macchis (which itself indicates that only one REAF plane was lost) after the other Israeli planes bugged out. he radioed back to Chatzor, "I've got five of them cornered," and attacked. Wilson spent the first half of 1949 training new fighter pilots and returned to Canada in June. After the war, he had this to say about the Egyptians he fought. To understand what we were up against, you have to understand something about the formation of the Egyptian Air Force. All its pilots were the sons of wealthy Egyptians, who became the glamor boys of the sky lanes, as it were, by joining the military air service. It was a sort of "gentleman's profession". They never expected a war to come along. As a result, although the Israeli Air Force was usually outnumbered in a dogfight, the Egyptians just didn't have their heart in it. (Cull et al 1994).